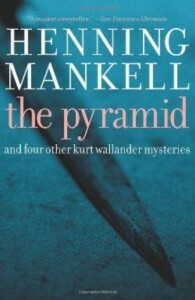 As a huge fan of the Wallander series on TV, particularly the Swedish version, I decided I should read some Henning Mankell as he is such a massive seller. This is actually a series of short prequels that chart the life of Wallander up to the point the original books start when he emerged as a fully grown senior detective. The stories are interesting but I have to say the translation is apalling - it is as if the translator has simply translated the literal meaning of the words into English - so I will read on and then get one of the other books to check whether they are the same. I have no doubt Henning Mankell is a brilliant writer - but his translator (at least in this book) is appalling - example "there had been a lack of precipitation..." in English we would have said "It hadn't rained.." there are loads of examples.